Afghanistan’s framework conditions are characterised by the years of conflict and a strong donor driven development. Even though improvements have been made to date with regard to the legal and administrative business environment the economic development institutions provide insufficient incentives for either national or international investors to engage in the Afghan economy. Government institutions are not yet capable of playing a developmental role in a free-market economic system. Furthermore, the private sector is still not organised enough to sufficiently incorporate its interests in the economic reform process. Northern Afghanistan is a structurally weak region, which is characterised by a fragile institutional environment, marginalisation and decades of openly fought and covert conflict. Some of the regions in the north (and in Badakhshan especially) are among the poorest in Central Asia. The most important economic potentials can be found in the agricultural sector. In the region’s urban centres, there are potential investors with substantial purchasing power (such as returnees and established merchant families) who wish to engage commercially, but who are not yet receiving sufficient backing from local support structures that could provide information and channel potential investments. A certain gap between the population and the administration is persisting. The security situation has a huge impact on the operations of the programmes. Events are cancelled at short-notice, travel restrictions delays the implementation of activities and there is the added burden of finding adequate national and international staff willing to work in the relatively insecure environment. It is therefore neither possible nor realistic to compare development measures in Afghanistan with other countries in the region. Dangerous conditions have also spurred the growth of private security services that protect government officials and business people. The Global Programme Development-Oriented Emergency and Transitional Aid –DETA offers support to the people in selected areas in Afghanistan where the government faces difficulties in providing the basic supplies and services required for survival. DETA ensures that public services are delivered during periods immediately following emergencies. Support is provided for a limited time period while at the same time promoting self-help capacity at all levels of society and the state. This way DETA encourages the implementation of sustainable solutions based on long-term strategies, while discouraging violent, survival-based behaviour that escalates the initial situation with possible longer-term consequences. The service GTZ-DETA provides includes short-term emergency aid to complex reconstruction programmes and food security projects. These integrated aid packages include preventive measures, reducing future vulnerability to crises and natural disasters and laying the foundations for sustainable development. DETA supports local communities in addressing their immediate developmental needs. DETA promotes the Sustainable Rural Livelihoods approach that is a people centred approach that aims to increase the sustainability of poor people’s livelihoods in Northeast Afghanistan. The intention is to assist the people in creating a livelihood for themselves and their households. Central approach includes capacity development at community and sub-national level. Of immediate importance for the people at the centre of the approach is the construction and rehabilitation of the production infrastructure and services needed to ensure sustainable livelihoods. This can include (production) infrastructure measures such access roads, bridges, irrigation canals, market places, or services such as marketing services, extension services, loans and credits, education, water, health and others. Emphasis is placed on ensuring that people are able to quickly achieve a basic level of livelihoods in a peaceful, equitable and sustainable manner. In order to promote the Sustainable Rural Livelihoods a District Development Fund (DDF) has been established. 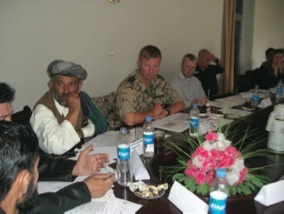 In 2003 the Government of Afghanistan and its international partners became increasingly aware that issues and challenges surrounding sub-national governance in Afghanistan would be crucial to national development, stability, and security. To react to these challenges, the government introduced Community Development Councils (CDCs), established under the National Solidarity Programme (NSP) to approximately two-thirds of the villages in Afghanistan. The objective was to enhance the ability of Afghan communities to identify, plan, manage and monitor their own development projects. Through the promotion of good local governance, the NSP worked to empower rural communities to make decision affecting their own lives and livelihoods. Empowered rural communities collectively contributed to increased human security. The programme is inclusive, supporting entire communities including the poorest and vulnerable people. NSP strongly promoted a unique development paradigm, whereby communities could make important decisions and participate in all stages of their development, contributing their own resources. With the support of Facilitating Partners (e.g. certified NGOs, etc) the communities elected their leaders and representatives to form voluntary Community Development Councils (CDCs) through a transparent and democratic process. 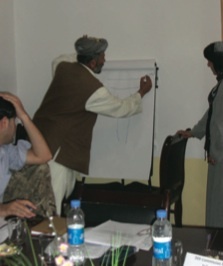 In 2005 the GTZ assessed the different DETA projects and programme it was supporting in the North of Afghanistan and concluded that there was a significant capability gap between the CDC that were being supported through the NSP process and the well-supported provincial level authorities. What was missing was the intermediate or district level capability. Many districts lacked the most basic of capacities and capabilities (especially remoter districts in the provinces). Certain basic services were and are needed at the district level, these include health, education, water, electricity and agricultural and livestock advisory services. In addition, the framework conditions to enable growth of private sector in the districts are also needed. To initiate and to encourage the development of a hierarchy of capacities and competencies, the Sustainable Rural Livelihoods concept and approach was developed and implemented in 2005. At the centre of the concept was the labour intensive backbone project - often a larger infrastructure project (compare figures 1 and 2), which was combined with income and employment generating support projects. The allocation and prioritisation mechanism was done through a transparent process as part of the district and provincial development funds. A core development hypothesis of the concept was that the allocation of resources to the two funds would promote and enhance a transparent, equitable and just allocation of resources (i.e. part of good governance process). The PDF was assessed in 2007 and was deemed to be an effective approach not only for introducing capacity development, good governance and transparency but also for coordinating the different German Government Ministries providing funds for the reconstruction and development of Afghanistan. This application example illustrates the main key processes that were undertaken in Afghanistan to implement the sustainable livelihoods approach with the backbone projects and development funds as the core elements. The sustainable livelihoods’ approach with the “backbone projects” at the centre is a people centred approach that aims to increase the sustainability of poor people’s livelihoods, especially in a post-conflict or post-disaster setting. Beneficiaries ability to manage conflicts peacefully improved. Conflict sensitivity amongst communities improved, peaceful conflict management approaches introduced and support peace opportunities undertaken. Figure three illustrates how the backbone concept leads to the impacts (first ring) and the outcomes (second ring) and how they are related to the sustainable livelihoods approach (SRL elements). Territorial concentration: In view of resource limits and absorption capacity limits, it is neither possible nor realistic to cover large geographic areas. It is almost inevitable that some form of territorial concentration is required. The area of concentration would be along the so-called developmental backbone. By investing in either more “hardware” related (roads, irrigation systems, etc) or in “software” related (i.e. natural resource management, income generating, employment generating and capacity development) activities the intention is to provide the communities with a certain continuity of investments over time. The territorial intervention along the backbone is a time-bound intervention lasting 2-3 years. Criteria requirements: Indicators /set of criteria need to be developed in order to be able to provide the basis for selecting intervention areas. The same indicators / criteria should then provide the basis for exiting the area after a defined period of intervention (e.g. 2-3 years). Sequencing: The time-bound intervention along the backbone needs to be followed up by further (sectoral) investments, especially capacity development. This would then allow for the consolidation and expansion of the initial impact along the backbone project. Financing instrument: In order to be able to fund the backbone and support projects resources are needed (e.g. personnel and funds). In fragile states, the state rarely has the necessary resources to fund such developmental measures; they are often dependent upon external donor assistance. In order to encourage greater transparency and good governance and as an approach for promoting efforts at decentralisation, the establishment of development funds at the sub-national level have proved very effective (e.g. district and / or provincial development funds). A set of rules, organisational framework and the necessary capacity development is required for the operationalisation and management of such funds. The time-bound geographical concentration of the backbone approach will be complemented by investments in other strategic areas in the area outside of the backbones (i.e. other districts or areas in a province). These investments are intended to provide some initial assistance prior to the arrival of the backbone approach in the area. Vulnerability, as measured in kcal/capita. Districts taking part in the National Solidarity Programme process. Bordering other countries such as Tajikistan. Pilot character and how representative district is for all other districts in the province. Level of security or insecurity. Number of developmental organisations working in the districts. Developmental priority of Provincial Recovery Teams. The following tables 1-4 provide some examples of how secondary data was used for ranking districts in accordance with different criteria. The tables show how different districts rank top of the list when different criteria are used. For selection purposes the proposal was to take the top 4 ranks for each criteria. The one receiving the highest number of rankings would be then selected (see table 5). In the districts that were selected as being the focal districts for the initial intervention areas, a key process was also to select a labour intensive backbone project. Backbone projects could be a rural road, primary irrigation channel, intensive re-forestation, etc. A key in the selection process was to ensure that, as many community members would be able to work on the labour intensive project for a period of 1-2 years. This would then ensure that the communities have work for a defined period of time. The selection of the backbone projects was undertaken jointly with the provincial and / or district development councils as well as with the governors and district managers’ office. Where even rudimentary district development plans existed and where prioritised projects had been elaborated, then this would be the primary place for selecting a backbone project. Ideally, the district and provincial councils would select the backbone project in a transparent way and the elected council members would then support the decision. In some cases the communities also initiated backbone projects. 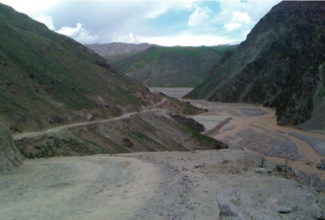 In Argo district an initial application for road rehabilitation by one community was made. During the survey work it became clear that the road was of significant importance for the many other areas in the district. After discussing this with the district manager, the governor and the DRRD it was agreed to upgrade the road application to become a backbone project. Each fund had different functions and objectives. The Provincial Development Fund (PDF) was a multi-agency fund (i.e. a fund into which different German Ministries such as the Foreign Office, the Ministry of Defence, the Ministry of Economic Cooperation and Development etc.) contributed to. The PDF was designed to support development projects in districts that were not selected as focus districts and/or were inter-district projects (e.g. roads between districts). The DDF on the other hand funds development projects in the focus district in and around the backbone projects. Therefore, the most important instrument for the backbone approach was the DDF. The District Development Fund (DDF) has been established with the support of the Government of the Federal Republic of Germany, represented by the Ministry of Economic Cooperation and Development (BMZ) and the MRRD. 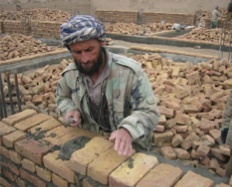 The objective is to co-fund Sustainable Rural Livelihood activities of the communities in North East Afghanistan. This could include the establishment and rehabilitation of basic socio-economic development projects and social services, including income and employment generation activities. The fund is also designed to provide capacity development and to promote democratic decision structures in the Afghan society. The fund has helped in strengthening all three levels of sub-national governance (e.g. province, district and community level) mainly district governance capacities, including the capacities of Community Development Committees (CDCs), which are local development committees established under the National Solidarity Programme (NSP). By connecting to and building up upon this priority programme of the Afghan Government, the DDF is an important instrument supporting and strengthening the development efforts of the Afghan Government through its Afghan National Development Strategy (ANDS). District Development Funds should by definition be administered and managed at the district. 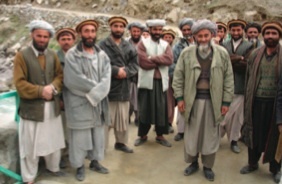 However, in Afghanistan the district level administration is only gradually emerging after years of turmoil in which decision-making power shifted from regional and local warlords to a more centralised (Kabul) oriented government (in some areas non-state actors have now also resumed power at the district and local levels). Although capacities at the provincial level have been strengthened the level of services that can be provided in remoter districts is limited. Although the communities were capacitated as part of the NSP process, the district level were rarely strengthened and supported. This led to a gap in the administrative and planning competence between community and provincial level. The District development Fund was designed to help fill this gap. As the capacity, competence and most important of all the good governance of the district improves, the resources allocated for direct administration by the district will increase. The speed with which the increase can be undertaken should be based purely on good performance. In theory, the amount allocated can also be reduced, if levels of governance are poor. Figure 4 illustrates how allocation of resources between DDF and DDF + changes over times, as capacity and the level of good governance increase at the district level to manage and operate such a development fund. The operations manual for the DDF regulates the entire operational process for the DDF. The manual defines the organisational structure (i.e. commissions, decision making bodies), the application, approval and management of the development projects as well as administrative accounting, reporting and monitoring functions. The manual should be short and precise and serves as the basis for addressing all administrative and management issues related to the DDF, including DDF+ (examples of such manuals can be found under “Development Funds” on the Methdodfinder website). A similar manual and approach was also developed for the PDF. Once the DDF has been established, the necessary organisational structure has developed and capacity development has been undertaken, the operations of the DDF commenced. Community mobilisation is a process of engaging communities through participatory methodologies with the objective of giving them the confidence to take responsibility for identifying potentials and solving problems that hinder them from tapping existing potentials. The community mobilisers from DETA actively supported the CDC and Shuras (e.g. local traditional councils) in all aspects of community mobilisation required for the projects, which the community had applied for. The mobilisers also looked into potential conflicts within the community and sought ways of addressing these prior to approving and implementing any projects to be supported from the DDF. Communities in North East Afghanistan were informed via the district authorities, the Department of Reconstruction and Rural Development (DRRD) and through the GTZ that CDC and Shuras could apply for support for their development projects as part of the DDF. In fact, all commission members have the right to inform the communities about DDF. Standard application forms based upon the already functioning National Solidarity Programme were provided to communities. The completed applications were then forwarded to the DDF secretariat for processing and assessing. A very important process is the assessment of the applications. The assessment of the community projects was undertaken by both the DETA social mobiliser, gender, agricultural and engineering experts, depending upon the type of project. The work is intensive, time consuming and resource intensive (logistics of reaching the remote communities and also costs involved in technically assessing the project proposals). Once the technical and social assessment of the projects has been completed key data from the project proposals were inserted into an assessment matrix. Upon completion of the assessment by the DETA experts (e.g. engineers, community mobilisers, gender or agricultural specialists) the information of the projects to be presented for approval by the DDF are inserted into an assessment matrix. The assessment matrix is part of the transparent presentation and decision-making system. In order to be able to compare larger and smaller projects, an efficiency criterion is used. Key factors such as costs, or benefits are divided by the number of direct beneficiaries, giving a cost/per beneficiary ratio. Thus the expected costs and performance of projects of different size can be better compared with each other. Figure 5 provides an example of the assessment matrix. Prior to the DDF approval session, all commission members are provided with copies of the projects to be approved as well as copy of the decision-making matrix as well as a map indicating the location of the proposed projects. If any other information is requested by the commission members this would be provided by the secretariat. Participatory approaches for approving development programmes has been quite a novel in Afghanistan, especially the fact that the total resources available that will be allocated is announced in advance. This allows for a matching of resources with those projects that receive the highest priority in the decision-making matrix. The number and value of projects almost always exceeded the available funds, hence the need for prioritising the projects. The projects are presented and discussed at length. Representatives from the districts attend the sessions, thus allowing for immediate answers to be provided to any questions the commission members may have. Pictures 2-4 highlight how the commission members discuss and reach decisions on the projects to be funded by the DDF. A joint contract between the CDC or Shura and the DETA-GTZ projects is signed upon approval of the projects. The next step involves getting the community to provide their contribution in-kind for the project. Unfortunately, this often proves to be a very cumbersome and time-consuming activity. Experience shows that the ownership of the projects significantly improves through the community contribution. The implementation process is guided technically, managerially and administratively. The supervision is important to ensure quality work and also to provide the community with the necessary guidance. It is also sometimes necessary for the community mobilisers to interact with the communities to address possible areas of tension and difficulties that occur during implementation (typically about labour or in-kind contributions). The DDF Secretariat and experts continuously advice, support and monitor the communities / organisations implementing the approved projects. 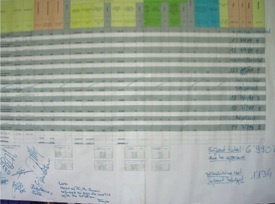 A project folder for each project is provided as part of the project documentation and monitoring process. The project folder contains all information related to the project, including copies of the implementation agreement, list of contributions of the community members, as well as advisory notes written by the technical experts during their monitoring visits. The project folder is accessible to all members of the community and is designed to ensure a maximum of transparency on all aspects of the project. The folder also provides the basis for accounting and reporting the projects to the donor and the German taxpayers. Maintenance of newly created assets is essential. It is therefore important that a maintenance plan is developed and agreed upon by the community and in some cases also with the district authorities. The maintenance plan should be as cost-effective and realistic as possible. Thereafter, the formal completion and handing over the project within the community / organisation can be undertaken. Project completion has to be documented by the DDF Secretariat. The formal handing over of the project is often a reason for combining this with a local festival or enabling politicians and donor representatives to participate. Although this concludes the whole cycle of processes, in reality the communities continue with their developmental activities. Many communities request support for new additional projects to be supported from the DDF. Other donor-supported projects are also undertaken within the communities, thus the processes has to be seen as a continuous process.